Cars sit in the parking lot of Hamilton Place Mall in Chattanooga, Tenn., in this July 24, 2017, staff file photo. More direct access to the Hamilton Place mall area and easing chronic traffic jams on nearby Shallowford Road are seen as two benefits to a $40 million interchange project at Interstate-75. The city is seeking proposals from engineering firms for services related to modifying Hamilton Place Boulevard near the mall to accommodate the state's I-75 interchange work. Staff file photo by Erin O. Smith / Samantha Robinson Freemon, Taylor Robinson, and Ralee Robinson, carry bags through Hamilton Place mall in this file photo. Stacey Keating, a spokeswoman for mall owner CBL Properties, said there's a lot of development occurring in the Hamilton Place area, particularly with the planned reuse of the mall's Sears store and its parking lots. "It will bring an influx of traffic to the whole campus," she said. 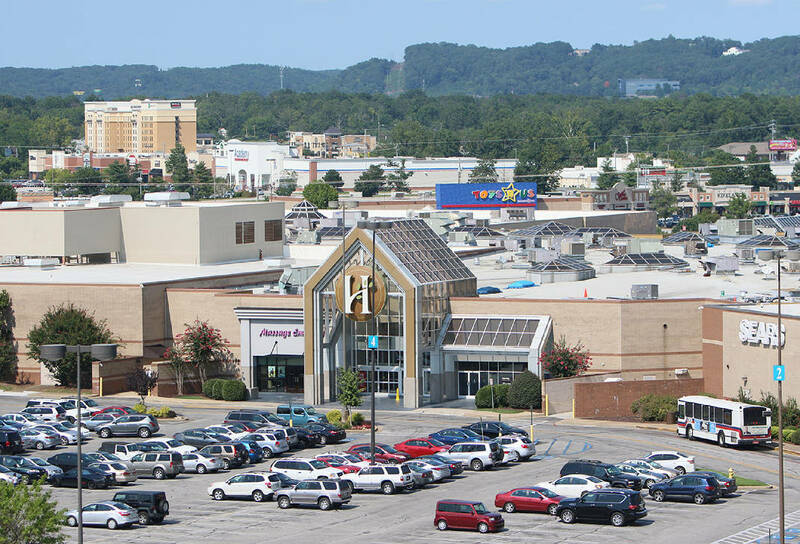 The planned changes to Hamilton Place Boulevard and I-75 will alleviate traffic problems and provide a more direct access to the mall area, Keating said. "It will help everybody," she said. The project will add direct access from I-75 southbound to Hamilton Place Boulevard as well as access to the northbound lanes from the mall. Jennifer Flynn, a Tennessee Department of Transportation spokeswoman, said the work on Hamilton Place Boulevard will connect to TDOT's interchange modification project. The city's local connector piece has to be done either at the same time as TDOT's interchange work or ahead of it, she said. Construction is seen as starting in September 2022, according to the city's request for proposals. Flynn said the survey work for the I-75 project is complete. Design work will begin in October. Right-of-way acquisition is tentatively scheduled for fiscal year 2021 and construction is slated for fiscal year 2023, according to Flynn. "If the project receives construction funding as is now tentatively scheduled, it could be complete sometime in 2025 or 2026," she said. The TDOT project is currently estimated at $40 million, but that figure could change as it goes through development, Flynn said. While the city is required to put up a match for the TDOT project, CBL Properties is expected to provide $8 million for that purpose, according to the shopping center developer and TDOT. "TDOT must deal directly with the city on obtaining the funding for the match even if CBL is providing it," Flynn added. Construction of a Cheesecake Factory restaurant is the first part of the redevelopment of the Sears store and its parking lots, which also could hold medical offices, a hotel and more eateries. The restaurant, which will be the first Cheesecake Factory in Chattanooga, is slated to open late this year on a lot next to the Sears.